Should shareholders of Seaspan and Vector Group be bracing themselves for a smaller payout ahead? Today's low-interest-rate environment has forced millions of investors to turn to the stock market to generate yield. However, the yield on the S&P 500 is only 2%, so some investors have purchased high-yield stocks in order to earn a better return. 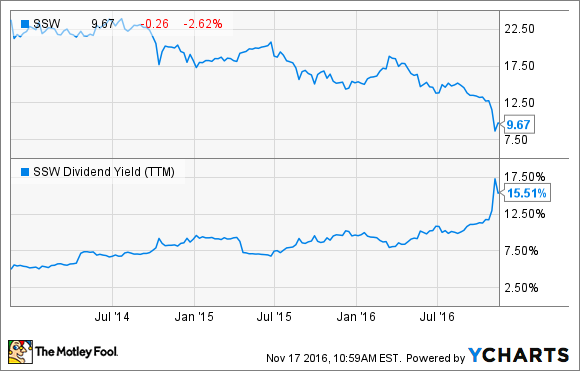 Unfortunately, stocks with yields that far outpace the market are not always a safe bet. In fact, a high yield can be one way that the market signals to investors that a company may be in trouble. Knowing that, let's take a closer look at two high-yield stocks -- Seaspan (NYSE:SSW) and Vector Group (NYSE:VGR) -- to determine if they may be at risk for a reduced payout. It's been a rough couple of years to be in the container shipping business. Demand hasn't kept up with supply, which has sent charter rates tumbling. The situation has gotten so bad that Hanjin, one of South Korea's largest liners, was recently forced into bankruptcy. In light of these factors, Wall Street has turned bearish on the entire sector. Seaspan, a leading containership owner and operator, has been caught in the carnage. The company's shares have dropped so much that its dividend yield now exceeds 15%, which suggests that Wall Street believes that a cut could be on the horizon. While the company always has the option of taking a hatchet to its dividend, a closer look at the numbers tells a different story. Seaspan's revenue and normalized net earnings actually continue to grow, and cash available for distribution to common shareholders continues to be far higher than the quarterly dividend commitment. How has Seaspan been able to pull this off? The reason is that its ships operate under long-term, fixed-rate charters, so its revenue doesn't fluctuate with charter rates. Add in the company's cost-control measures, and its results have remained quite stable. That's all great, but it is still possible that Seaspan may choose to cut its dividend anyway. After all, the market isn't giving it any credit for maintaining a high payout, so you could argue that shareholders would be better served with a hefty share-repurchase program instead. In addition, the Hanjin bankruptcy may allow Seaspan to go bargain-hunting for new ships, or it could use the extra capital to pay down debt. Those might be attractive enough alternatives for Seaspan's board to seriously consider slashing the payout. On the flip side, Seaspan knows that its shareholders want a big dividend, so bad things would likely happen to its share price if it did decide to make a cut. Seaspan announces its dividend policy for the year ahead during the first quarter, so shareholders who are banking on a high yield will want to stay tuned. With a dividend yield that exceeds 7%, Vector Group is another company that likely attracts many income-focused investors. This company makes its money from two distinct businesses. The lion's share of its revenue comes from sales of tobacco products, but it also owns a real estate business that contributes 40% of its revenue. Through the first nine months of the year, total sales at Vector Group are up around 4%. However, favorable leverage allowed the company's net income to grow by 29%. Analysts even expect that earnings will grow by 11% annually over the next five years, which is a solid result for a mature business. So, given all of these positive trends, why should shareholders worry that this company's dividend might be in danger? The answer lies in the company's payout ratio. Even after factoring in the 29% earnings growth, Vector Group's dividend still consumes more than twice its net income. This isn't a one-time anomaly, either. In 2015, Vector Group's dividend cost the company $191 million, which was more than three times its annual net income of $59 million. We saw the same story play out in 2014 and 2013, too. To make up for the shortfall, management has been relying heavily on debt. Total long-term debt stood at $534 million at the end of 2011, but that figure currently exceeds $1.24 billion. Simply put, those numbers are unsustainable in the long term. To be fair, Vector Group's CEO, Howard Lorber, recently boasted on his quarterly conference call with investors that the company has paid an uninterrupted dividend since 1995. His statement that "its cash dividend policy remains the same" implies that he is not worried about the high payout ratio. Still, numbers are numbers, and I'd personally be leery of any company that borrows from tomorrow in order to fund today's dividend payment. To be crystal clear, I'm not suggesting that Seaspan or Vector Group will be forced to slash their dividends anytime soon. However, investors in both companies should be aware that a lower payout isn't out of the question. If big dividends are what you are after, there might be better companies out there for you to consider instead.